When Melantha Caldwell turns sixteen on Valentine's Day she will come into her spell-turner powers. It should be the happy event she's looked forward to her whole life, but at the moment she could care less. 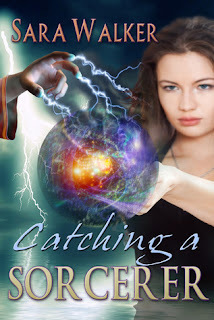 A sorcerer has pulled her mother and magic doesn't seem to be working for her anyway, so Mel would rather have nothing to do with magic ever again. She just wants to be a normal fifteen year-old, living a normal life in Ottawa, doing normal things like going to high school, and having a boyfriend. But a social life is not something Mel's Gran will let her have. The elf leaves Mel with a guardian - the most annoying creature on the planet: a talking cricket. The boy Mel hopes to make her boyfriend suddenly takes on a super jealous streak. And if she doesn't get the job done, a cures will be upon her. Literally. What's more if Mel doesn't catch the sorcerer, he will succeed in his plan to remove magic from all spell-turners, and as much as she hates magic, Mel knows she can't let the sorcerer succeed or she'll lose everyone she cares about. This book sounds like it is definitely going to be interesting. I cannot wait to jump in and read about the cricket. He sounds like he will add a bit of a comical element to the story. Thank you so much to the author for providing me with a copy of this book to review! I cannot wait to see where it takes me! Just a small disclaimer for those reading this review. I have received this book in exchange for an honest review. Please note that this does not affect my opinion in any way. All thoughts are my own. The writing was easy to get it. It also had a good flow. I just found that it told more than what it showed. But other than that, I really enjoyed it. The dialogue was natural and often amusing. And more often than not, there was humor amongst the words. The plot was interesting and unique but it just took a long time to actually get going. I was that even though we sort of knew what was going to happen, the how was kept a complete mystery. I enjoyed the plot and thought that it was well planned. There were some parts of the story that I really enjoyed and thought that it was cute. Melantha is a sixteen year old teenager but I kept asking myself what age she was because she often acted way younger and seemed a little childish at times. From her behaviour I would have guessed that she was about fourteen. Other than that, I thought that she was well developed and was an interesting character. The other characters were also well developed but every now and again they would feel flat. Overall, I thought that the book was interesting. There were some elements that I enjoyed like the plot and now and again I really liked the characters. I thought the writing was good but felt like there wasn't a lot of detail. In the end, I enjoyed the book and I cannot wait to read the second book in the series. Thank you so much to author for sending me a copy of her book!